(CNN) -- Investigators have heard a signal from the flight data recorders of the Yemenia Airways plane that crashed last week, they announced Sunday. Search parties continue their operation to locate the Yemenia Airbus A310 off the Comoros Islands Saturday. "A signal was picked up from two acoustic transmitters from the plane's flight data recorders during a sea search to locate the data recorders this morning," the French air accident investigation agency, known as the BEA, said in a statement. 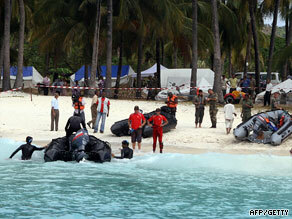 Commonly known as "black boxes," the data recorders should contain information to help determine what caused the crash. The Yemenia Airways Airbus 310 crashed into the Indian Ocean early Tuesday, carrying 142 passengers and 11 crew members. It originated in Yemen's capital, Sanaa, and went down just miles from Moroni, the capital of the Comoros Islands. The teen's father, Kassim Bakari, told a French radio network that his wife and daughter were flying to Comoros to visit relatives. "When I had her on the phone, I asked her what happened and she said, 'Daddy, I don't know what happened, but the plane fell into the water and I found myself in the water... surrounded by darkness. I could not see anyone,'" Bakari told France Info. The head of the rescue team in the Comoros told French radio RTL that the teenager beat astonishing odds to survive. "It is truly, truly, miraculous," Ibrahim Abdoulazeb said. "The young girl can barely swim." Another rescuer told France's Europe 1 radio that the girl was spotted in the rough sea, among bodies and plane debris in darkness, about two hours after the crash. The Airbus 310 plane tried to land at the airport in Moroni, then made a U-turn before it crashed, Comoros Vice President Idi Nadhoim said soon after the accident. A French official said the nation had banned the plane after it failed an aviation inspection in 2007. "Since this check-up, we have not seen the plane reappearing in France," said Dominique Bussereau, the transport minister. But Yemenia Airlines was not on the European Union's list of banned airlines, he added. Passengers on the flight included 66 French citizens, 54 Comorians, one Palestinian and one Canadian, according to Yemeni and French officials. The crew was made up of six Yemenis, two Moroccans, one Ethiopian, one Filipino and one Indonesian. The Comoros Islands are between the east African country of Tanzania and the island nation of Madagascar.